Pluto and Charon have been captured like they never have before. Scientists at NASA have used the New Horizons spacecraft to create an incredible portrait of Pluto and its moon Charon like we’ve never seen before. The images shows the cosmic bodies during the course of a full day — about 6.4 Earth days, according to a Mashable report. The photos were snapped between July 7 and 13 by New Horizons from a range of between 400,000 and 5 million miles. A full Pluto day is when it makes a full rotation, and it spins at much slower rate than the Earth. These photo could help NASA scientists understand the surface of Pluto more fully, but the fact that New Horizons was quite far out by the time it could snap the other side of the dwarf planet means they are lower resolution, making it more difficult to create a full map of the surface, at least in the detail they would like. 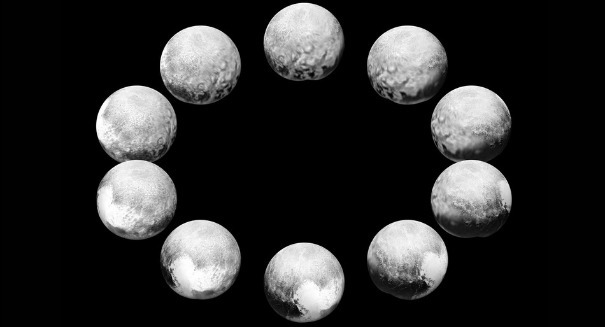 Still, it’s a huge new development that adds to a long list of Pluto discoveries since New Horizons arrived at the planet months ago. And discoveries will continue to keep trickling in, as the spacecraft still has a lot of data to send back to Earth from that flyby. Photos were also captured of Pluto’s moon Charon. There are four other smaller bodies that also count as Pluto’s moons: Kerberos, Nix, Hydra, and Styx, which are more misshapen bodies because of their small size that tumble rather than spin around Pluto. Charon was discovered as recently at 1978 by the U.S. Naval Observatory. It is quite large compared to Pluto, its host, being as large as half the diameter of Pluto, although it has only an eighth of the mass. New Horizons flew past Pluto on July 14. It also came within just 27,000 kilometers, or 17,000 miles, of Charon, making it the only probe to have visited Pluto and Charon.